Hello. I'm Tony Colabella, of Mathnasium of Richmond BC, your neighbourhood math-only learning centre. We help kids in grades 1-12 understand math by teaching the way that makes sense to them. The centre is now open! We are located in Blundell Shopping Center (#135, 8100 No. 2 Road). Come by to see the centre and get a free assessment for your child. Excellent my son has a great time and learned so much. Keep up the good works!!! My daughter enjoys the interaction at .Mathnasium and has developed greater comfidence in her abilities. Excellent learning Center. My son loves going there every week. Instructors are very nice and patient. We couldn’t be happier with the success we are having with the support from Mathnasium. Tony and his team have helped my son like math again. When we went to see Tony we knew that Mathnasium is the right place for our daughter. We’ve spoken to several parents and students who have been extremely satisfied. After just several sessions we can feel how our daughter started to build her self confidence. Now, she is looking forward to going to Mathnasium atleast three times a week. Thanks to Tony and Team for all the support. I highly recommend Mathnasium. The monthly arrangement is ideal. My daughter needs intermittent help and the monthly setup is great. We love Mathnasium! It's my son's favourite activity of the week. My 7 year old son loves Mathnasium. Coming from a British Prep school, he was ahead of his classmates, and was frustrated at school doing things he learned 2 years before. We knew about Mathnasium as it has a strong reputation from our previous country. As soon as we went in, we felt reassured. Tony honed in on his exact level and identified his strengths and weaknesses with 2 different assessment tests, and created a math learning plan which is customized for him. He is able to work at his 'actual' math level which is two grades higher. He is engrossed in his math work whilst there, but above all, our son has gained his confidence back and remembers how clever he is. We are grateful to have Mathnasium in his life as it has been a real life saver for our son, who says math is his favourite subject and continues to be challenged by it. Thank you Tony! Great so far, I can’t believe that my boys actually look forward to attending. They’re feeling much more confident about math in general! We’ve tried several tutors for our son and Mathnesium is the first place he has felt comfortable in and he is actually EXCITED about math! With that attitude shift has come increased effort, higher ability, and better grades. We’ve only been attending for a month and we are very pleased with the results! 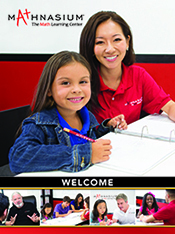 I recommend Mathnasium Richmond to anyone who wants to ensure their child is succeeding in math. Tony and his team are so knowledgeable and easy to work with. The owner of the Richmond branch is very helpful and responsive. Thank you Tony and staff for your work with Sarah. She seems much more comfortable in math now. My son is struggling in math and as a parent I can do anything to find a way to help my son.i found mathnasium and I talked to the owner mr.tony and feel that this place can help my son.Now,I can see my son have confidence in math,Mathnasium help a lot to get better and better understanding about my son math subject.Thank you so much mathnasium!! !😀😀😀Have a nice day!!!!! Jackson’s struggle with math started in grade 4. We tried private tutors until grade 9 when he failed math. He was enrolled in summer school and passed with 51%. All his other courses suffered due to his lack of success with math. I couldn’t help him, nor could his father. We both lacked the math knowledge. A lucky moment happened during the summer before grade 10. We found Richmond mathnasium. We enrolled Jackson and almost immediately his attitude changed, he started doing BETTER in all his courses. He is now finishing grade 11 math and has 83. Thanks Tony and all your team. P.S. Jackson’s dream of attending college will happen and We owe it to this system of how they teach math!!! We are very glad to have made the decision to sign up our daughter at Mathnasium. The staff has helped my daughter gain some confidence and enjoyment for math. She is very motivated to go get extra help without any hesitation. Before Mathnasium both my girls were feeling very tentative about math. They knew they had lots of gaps and were nervous whenever they had to learn new things. Mathnasium was a safe and fun place where they could ask questions and get the help they needed in order to feel more confident about their math skills. They rarely missed a day at Mathnasium all summer and were always happy to stay for an hour or two. The environment, program and staff at Mathnasium were all amazing and my kids are going into a new school year with a more solid foundation and a more confidence in their abilities. My kid loves going to Mathnesium and I can see the improvement clearly. The administration and teachers are great! The Ambience, instructors and the director of Richmond location are outstanding. I feel they put 100% in their work and make math really fun for the kids. My daughter has enjoyed going to Mathnasium in Richmond. The staff has helped her tremendously to improve her grade and I've seen the confidence in her since she started going there. I would definitely recommend this place. Very flexible and my child actually likes it!